Gorse Hill City Farm is a charity run farm and community project on Anstey Lane, just north of the city centre. It’s open every single day of the year for you to get up close and personal to over 100 animals, including some rare breeds like the Leicester Longwool sheep. A picnic barn can be hired for a small cost which means that the weather is no obstacle when visiting this farm with your unit. There are small animal handling sessions that can be booked or you could go mini-beast hunting and pond dipping. There is a limited amount of parking available at site, so why not continue your adventure by getting the bus! The No.74 First bus runs from Leicester City Centre. There is a small admission cost. Head over and explore nearby Western Park. There is lots of space to play a wide game or have a picnic. There’s a huge playground. There is even a special designed bike track – could you be the next Olympic champion? A number of fun days are held at the park so keep a look out on the link below for more details. 1. If you're using eggs, boil the eggs until they're hard boiled. Take the tops off gently. You can eat the boiled eggs - try them with toast soldiers - yummy! Clean the inside of the eggs gently, so they don't break. If you're using yoghurt pots, clean the inside of the pots. 2. 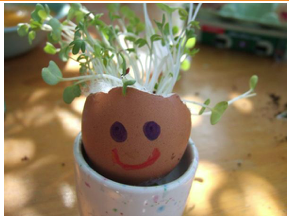 Draw a face on the egg shells or yoghurt pots using felt tips or paints. 3. When the paint has dried, wet some kitchen roll and put it in the bottom of the egg shells or yoghurt pots. 4. Wet some cotton wool and put it on top of the kitchen paper. Make sure there is a gap between the cotton wool and the top of the egg shells or yoghurt pots. 5. 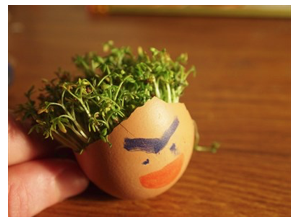 Put some cress seeds on the cotton wool and press them down gently. 6. Put your egg shells or pot in a sunny, warm spot - try a kitchen windowsill. 7. You can make a greenhouse to put over one of the egg shells or pots. Ask an adult to cut the top off a plastic drinks bottle. Put the bottom half of the drinks bottle over the top of one yoghurt pot or egg shell. The inside of your greenhouse will be warm and damp.